I did some major piecing. I even worked out a system that would allow me to be working on three projects at once! I could have spent some time working on those 9P & stripe quilts I started in January, but decided to start some new projects, instead. 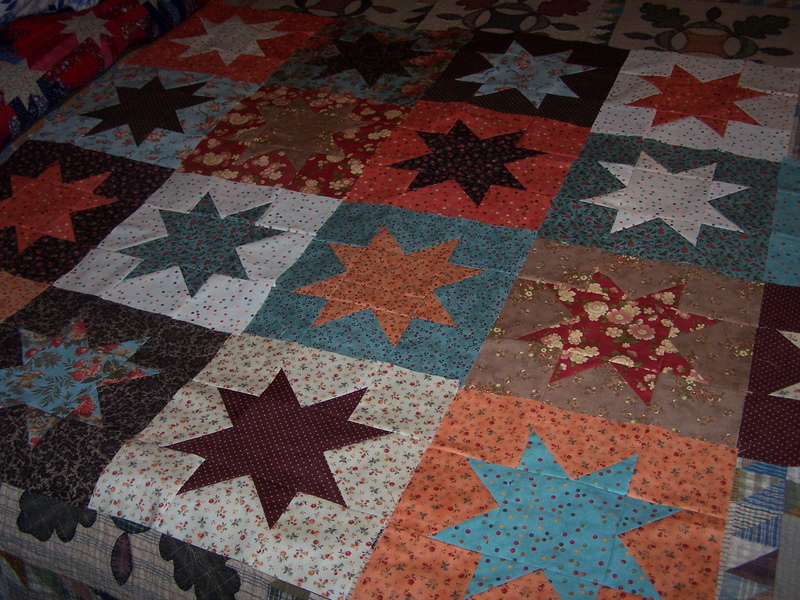 I started on this Gracie’s Star quilt. I’m not sure if my fabric choices are really working together, but I’m going to keep going, and make my mind up about that later. I started on this Darlene Zimmerman Boston Commons, in 30’s repros. I have had all the fabrics for this for quite some time. It feels good to finally be started on it. And, while working on these two former PIGS, I made some more progress on the Oklahoma Backroads scrap quilt, also a leaders/enders project. I g0t these blocks together, and did more piecing of pieces needed for additional blocks. This is truly a scrap quilt, with a little of everything thrown in. It is stretching my ability to let go, and quit trying to put “just the right” piece here, and there, and just sew! And I’m working on getting one final finish for 2008. I’m just about finished with the binding/labeling of my Dad’s log cabin. I will make it! Whew! Oh, and I should probably report that I ordered 48 more yards of fabric from Thousands of Bolts, since I already blew it for 2008. Figured I might as well blow it big! I like you attitude. At least it will be easier to bust the stash in 2009! 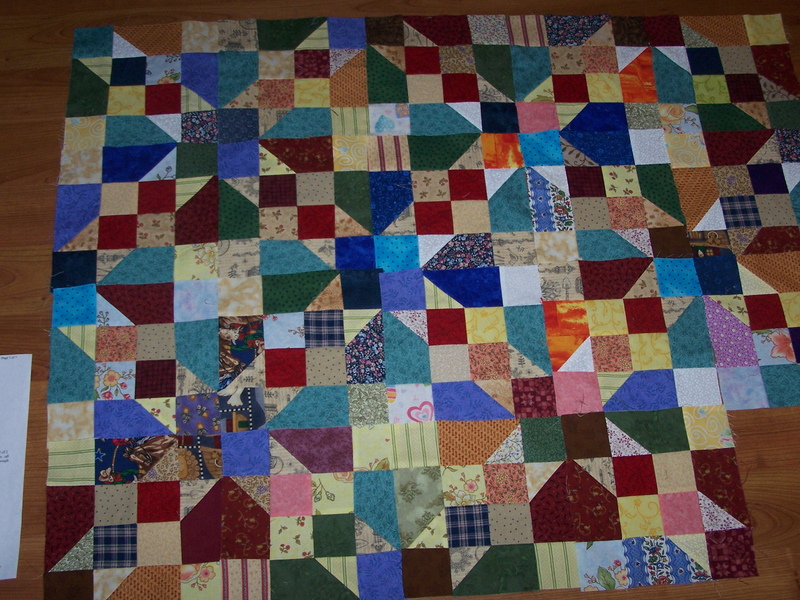 It is very hard for me to let go on the first scrap quilt that is pieced. After the first one, I was addicted! I like Gracie’s Star – I think it’s working out great! I am so jealous of your sewing time! I am still laying on the floor nursing my back but it’s getting much better and I might be sewing some this weekend. I really like that Boston Commons pattern a lot too! Wow Randi, you’re making good progress there on your vacation, isn’t it fun to work on stuff for yourself for a change? Gracie’s star looks good to me , and the boston commons too! Happy New Year! I love the fabrics in Gracie Star. Looks like you got a lot done. Have a very Happy New Year. Your quilts look fantastic! Would love to hear more about this “system” you have going to work on multiple WIPs at once! Organization/processes interest me a great deal! I love your Gracie’s star. I love floating stars! No points to cut off. I can’t wait to see your Boston Commons too! I love them all. Glad to see you making “you” time during vacation!! Just think how easy it will be to use your stash in 2009 with all those yummy new fabrics…… LOL!! Well of course you bought fabric. That would be the souvieners for your vacation. Right? Love the OK Backroads; a delightful pattern and lovely colors! I’m ga-ga over the colors you chose for your stars!! The fabrics are gorgeous! 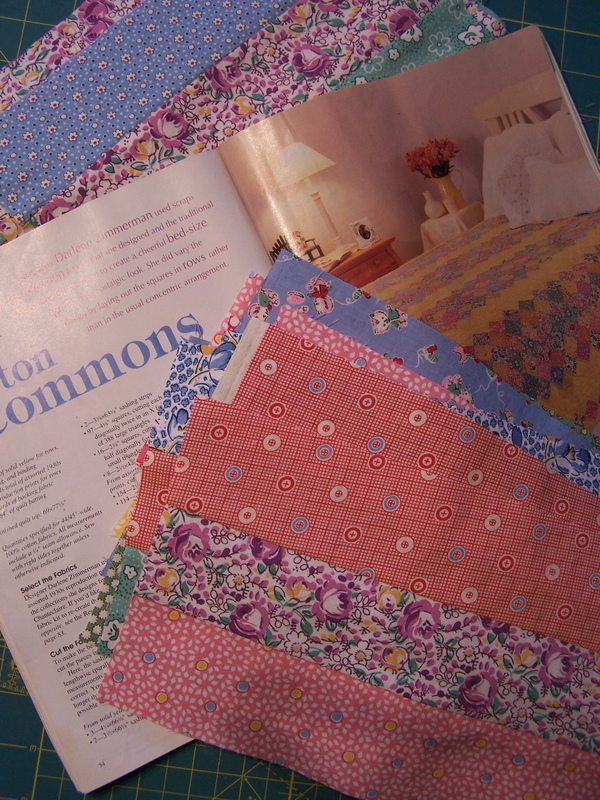 I’ve got some of Darlene’s books and am especially fond of the Boston Commons pattern. There is an old black and white photo of women working on one of those quilts during the depression. Have you seen it? I love the new projects you’re working on, especially your 30’s repro. I have been collecting that kind of fabric as well, and am trying to decide between 2 different patterns to use it on. Dilemmas! And I love the scrappiness of the OK Backroads.